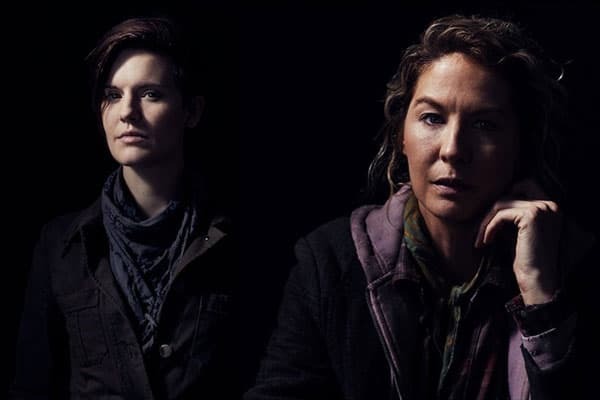 Maggie Grace, Jenna Elfman and Coleman Domingo, the stars of AMC’s Fear the Walking Dead were at WonderCon to talk about the direction of the new season, the addition of Morgan (Lenny James) and why they wanted to be part of the show. Jenna, this is not your genre really. What is then like to be a part of the show? Jenna Elfman: It’s not my genre that’s been the past whatever, but it actually was before I even knew I could do comedy. I was doing drama and then the comedy boat went and then I’ve just been on that cruise. I was super honored that they came to me for this. I was really ready for a change. Something I really wanted was to lean in as a woman who’s lived life, and reared children and had a lot of experiences. I really, really was looking forward to a project where I could really lean into the human story, and human emotion, and tell a real story where I can stay in those moments, and connect with people, and really connect with humanity. This came my way and fell into my lap, and it’s been incredible. The writing is superb. It warms me. I love it. I get so excited for every script. The actors are incredible. You look at them in the scenes, and you’re in. It’s such a delightful experience. I’m really enjoying it. I feel very blessed to have gotten this opportunity to delve into this character. I think the universe that Morgan’s character is bringing is massive and important. I really, really, really like being part of this. Maggie, you interact with Morgan at some point in the show. Can you tell us about that? Maggie Grace: Yeah. I think it was such a boom to be able to be paired with Lennie right away. He’s such a warm and generous actor. I’ve been a fan of his for a long time. This is the man that re-opened The Globe Stage in Two Gentlemen of Verona. As an actor, you’re just like “Yes.” Yeah, he’s really lovely and I’m really happy the characters are finding an interesting shorthand between them at times. I think there’s a sort of kinship there that they’re discovering. And Al is incredible. I love playing her. It’s an unusually capable character who can even not only survive but thrive in this post-apocalyptic world because of who she was before, even after how much is lost. I think also as a woman, finding a character that’s really not ornamental or eroticized, that she has an agenda, that she makes decisions and takes actions every day to pursue that agenda is pretty freaking awesome and unusual. What can you tell us about where Strands character is now that we’re in this time jump? What can we expect? Colman Domingo: I think especially because of the fallout of season three, everyone was scattered in many ways. We all were licking our wounds and there was a little backbiting that happened and backdoor dealings. Now, when we find Strand, he’s part of a community. He’s trying to move forward and become something else. He’s challenged with some of the things that haunt him in the past, and the choices and decisions just as we all do. He’s trying to move forward the best way that he can using the tools that he knows how to survive. Of course, some things may come up to rear their heads, if it means his survival’s at stake. We’ll see where he is. He could be the warm and fuzzy uncle to people and best friend, or you better watch your back. I know you can’t tell us much, but maybe you could tell us how you feel like your character and Morgan’s would match. Colman Domingo: I am gonna tell you what I think that our show owners have been laying out. What’s been important for the season is to see the question of love again, and where is love, and how we’re trying to find it. There’s hope there. What you find in all of our characters, I think what we’re trying to engage, we’re trying to find that love again. There are things in the middle of it, different needs and wants. I think that’s where we meet each other, where we’re trying to find a way to love again, whether it’s each other, someone else, community, build something again. Of course, there’s always something in the middle. There’s conflict in some way. I think that’s where all of our characters are trying to find each other. At the center of it, I think the conversations we had at the beginning was seeing people laugh again. People have hope. The reason that we’re going forward, the reason why we have to go through all this mess and mire to rebuild again and love harder. For Maggie and Jenna, I know that you are new additions to this world. Were you big fans of the world of The Walking Dead before? And if yes, did you have a moment of fanning out? I hadn’t prior, but I certainly have delved in and seen all of Fear, I’ve seen almost every single short of half a season, everything of Walking Dead. I’ve seen almost everything and I’m in. I feel very passionately about this universe and the mythology of The Walking Dead universe. I’m a giant fan. I’m a giant fan of the themes, especially what we get to explore with Morgan coming over. A lot of his themes that he’s been experiencing throughout The Walking Dead storytelling, I feel a kinship with, and I feel very passionately about, and have been… I love it. Here’s a big theme that we’re exploring that I love, that I know I’m allowed to say, and Morgan has gone through this leading up to this, is those themes of community versus isolation. Who are you in those two environments and reconciling for oneself what’s the best version of yourself. In a community or by yourself? The struggles and benefits of both, and the deep-rooted urge to survive weaving through those scenarios. I’m a big fan of those themes. Maggie Grace: Likewise. I have seen every episode of Fear and love how character-driven it is. Also, it’s such a grand flexible metaphor for social decay, the whole zombie genre. This show in particular wraps its arms around the ethical and moral compromises people make. There’s lots of interesting storytelling to be done there. I also love that no matter how much I geek out, there’s this really warming engaged community of fans who’s gonna geek out so much harder and school me so hard when I mess up. I’m sure they’ll be moments where I’m unaware. Maggie Grace: They’re smart scripts, yeah.